Set a large (10-inch) skillet over medium. Add the chorizo and cook, breaking up large chunks, until the chorizo is beginning to brown and is cooked through, about 10 minutes. Scrape on to a plate lined with paper towels and let cool. Return the skillet to medium heat, measure in the oil and add the onion. Cook, stirring frequently until it begins to brown, 7 or 8 minutes. Stir in the garlic and poblano and cook for 2 minutes. Taste and season with salt, usually about 1/2 teaspoon. Scrape the rajas into a bowl and cover to keep warm. In a large bowl, combine the ground beef, the cooled chorizo, the chipotles and 3/4 teaspoon salt. Mix thoroughly but lightly (to keep from turning out an overly compact texture). Divide into 4 portions, lightly pressing them into patties the size of your buns. Lay the hamburger patties on the hottest side of the grill and cook until the grill grates have seared beautiful marks on one side, about 2 minutes if your grill is quite hot, then flip and cook until the hamburger is a little less done than you like (usually a couple of minutes longer for rare to medium rare). Move the burgers to the cooler side of the grill. Lay one piece of cheese on top of each burger, top with a portion of the warm rajas and then another piece of cheese. Close the lid and continue cooking until the cheese has melted, about 1 minute. Remove from the grill and place on a toasted bun. Serve immediately. Looks disgustingly delicious! Not your basic health burger, but I plan to try it this coming Fourth of July. One thing; would those chili sauced buns you see at every Tortoria in Mex. D.F. work on those burgers? & do you have a recipe for those enchilada buns (bollas)? Great idea! A cross between a traditional torta ahogada and a burger! 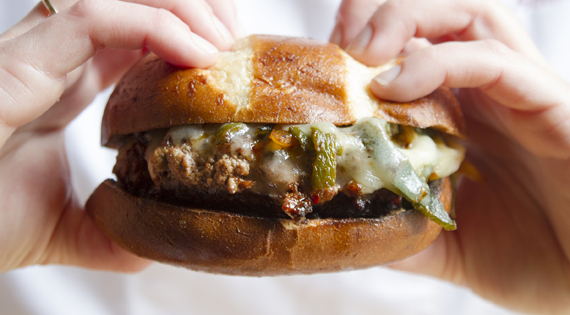 We tested these burgers on pretzel and brioche buns. The problem with using sauced buns is that you risk the whole thing falling apart – but go ahead and give it a try! I am making a grocery list right now! I am making queso fundido burgers and corn on the cob and strawberry shortcake for dinner. My husband is from Mexico City and I lived there for 4 years so when your show is on we just sit there and drool because we know how awesome it is. I have quite a few recipes that I collected from friends and my father in law and sisters in law. I consider myself a pretty good Mexican chef but I love learning new things and seeing Mexico. For the love and respect to my culture!!! My gringo friends laugh at me all the times, they can’t believe a Mexican need recipes from a gringo, but I love every thing you make and thank you very much for it, you make us feel so proud to be a Mexican my four sons love to cook and they adore you. You chefs aren’t the only ones involved in these cooking competitions. 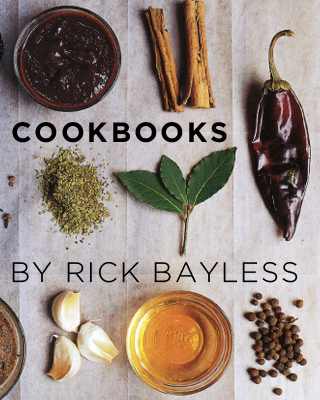 This Sunday I’m involved in a competition among friends where everyone has to make a Rick Bayless recipe. One participant will be judged the winner. I feel that having the opportunity to try each recipe everyone wins. So far the hardest part is finding the foreign ingredients your recipes require. A shopping I will go. I’ve been making your habanero hot sauce for upwards of 5 years. It is amazing. You really bridge the gap between real mexican food and americans. nobody else does this. Thanks Rick for all you do. This burger tastes like heaven! Keep doing what your doing! Maybe next time add little more cheese! This burger tastes like heaven. Next time add more cheese. That’s great to hear. Here’s a whole page of side dishes to get you thinking, and here’s the link to a bunch of salad (and soup) recipes. Two of our favorites around here are the Grilled Asparagus with Creamy Pasilla Chile (you’re already grilling, right?) and this Avocado Mango Salad with Fresh (Or Blue) Cheese, Bacon and Toasted Pumpkin Seeds, though if you choose that for a side, you may wish to scale down the portions a bit. 1. the beef should be shopped, no matter from what cut it derives; ground beef always tastes like hamburger, chopped beef tastes like … well, beef. 2. Two thinner patties, same amount total — will give you much more surface area for the grilled-browned flavor component. And I thank you for all your good work. Pingback: Queso Fundido Burger With Poblano Rajas #BurgerMonth - Cooking In Stilettos??? I think I first saw this recipe in my local newspaper around 2013, after which I became a huge Bayless fan. There was one difference though, chipotle mayo. Throw one chipotle pepper (in adobo sauce), 1/4 cup mayo, a pinch of salt, and juice from a lemon wedge into a blender and puree. Spread onto the buns.